“A company which sold pacemakers and implantable cardioverter defibrillators in Germany found, after carrying out quality control checks, that those products might be defective and constitute a danger to patient health. In view of that situation, the producer recommended physicians to replace the pacemakers implanted in patients with other pacemakers provided free of charge. At the same time, the manufacturer recommended treating physicians to deactivate a switch in the defibrillators. Let me start by saying that this case is special in the sense that the manufacturer himself recommended replacing the pacemakers of a specific type as a corrective action. The recommended corrective action for the ICDs was to deactivate a magnetic switch that might be stuck, as a result of which any cardiac dysrhythmia that could be fatal would not be recognised by the defibrillators and no life-saving shock would be given to the patient. Not all product liability cases involve a specific corrective measure. The claim made by the healthcare insurer of the affected patients was based on product liability, which is harmonized in the EU under the Product Liability Directive. The manufacturer defended himself by arguing that although he had recommended replacing the pacemakers from a specific batch, this did not mean that they had admitted that all pacemakers in the batch were defective in the meaning of the Product Liability Directive, nor could it be assumed that every pacemaker in the recalled batch was defective just because they were in a batch that was recalled. The national court decided to refer this to the European Court of Justice for a final word on the aspects of EU law. The referring court found that the outcome of the disputes in the main proceedings depends on whether the pacemakers and the cardioverter defibrillators implanted in the insured persons concerned are defective products within the meaning of Article 6(1) of Directive 85/374. The referring court further found that it has not yet been determined whether, as those devices form part of a group of products that pose a risk of failure, they are themselves defective. “38 The safety which the public at large is entitled to expect, in accordance with that provision, must therefore be assessed by taking into account, inter alia, the intended purpose, the objective characteristics and properties of the product in question and the specific requirements of the group of users for whom the product is intended. 39 With regard to medical devices such as the pacemakers and implantable cardioverter defibrillators at issue in the main proceedings, it is clear that, in the light of their function and the particularly vulnerable situation of patients using such devices, the safety requirements for those devices which such patients are entitled to expect are particularly high. The result from this broad interpretation of the concept of ‘defective’ is that the scope of the concept has been expanded to include devices in the same batch that may or may not have the defect but are subject of a corrective action to mitigate the risk that they have the defect. This extension of the concept of defective also changes the burden of proof of the person claiming damages under article 4, one of the cornerstones of the directive since the directive is based on a trade-off between one the one hand no fault liability for the manufacturer provided that the injured person proves damage, defect and a causal link between the damage and the defect. While the producer accepts no fault liability, the “injured person shall be required to prove the damage, the defect and the causal relationship between defect and damage” pursuant to article 4. As a consequence of this judgment, this burden of proof rule does not automatically apply in case of product liability alleged for a device in a batch of potentially defect devices subject to a corrective measure of the manufacturer. Alternatively one could assume that the burden of proof is automatically met if the manufacturer initiates a corrective action for the devices concerned, but this is not discussed in the judgment. “51 In the present case, as is apparent from the order for reference in Case C‑503/13, G. recommended to surgeons that they should consider replacing the pacemakers in question. 52 In that case, the Court finds that the costs relating to the replacement of such pacemakers, including the costs of the surgical operations, constitute damage within the meaning of section (a) of the first paragraph of Article 9 of Directive 85/374, for which the producer is liable in accordance with Article 1 of that directive. In other words, we do not know very much now because this is a very factual question that each national court may decide for itself in the context of the device concerned – unlimited permutations possible. What about devices that do not need to explanted in order to mitigate the risk resulting from the potential defect? This case concerned the costs of the medical procedure to replace the high risk implantable medical device subject to the recall. The ECJ seems to take the view that the patient should never have to pay for the costs to remove a device that is potentially defective by the manufacturer’s own judgment and exposes the patient to very high risk if it is not removed. So, what other devices could be covered here? First, foremost and obviously, the liability would not seem to extend to implantable devices that can diagnosed from the outside, e.g. a pacemaker that was in the batch of potentially affected products, but which can be diagnosed and established not to have the defect. Secondly, the device has to have a particular risk profile as a consequence of which patients are in a ‘particularly vulnerable situation’ and it must have an ‘abnormal potential for damage’. What this concept means is not explained in the judgment, so this will be subject of further clarification in the courts. I will explain below why this criterion is absolutely unhelpful for medical devices (or other regulated life sciences products for that matter). What is ‘abnormal potential for damage’? What devices are covered by this product batch liability? The reason for product batch liability comes after all, according to the ECJ, “from the abnormal potential for damage which those products might cause to the person concerned” (point 40 of the judgment – italics added). First, it would seem to mean that there is no reason for such liability for devices that have a lower risk profile than those devices, let’s call that a ‘normal or lower’ potential for damage. Secondly, the use of the term “abnormal” potential for damages is very tricky in my opinion because it does not take account of the fact that with all potentially dangerous products the risk is always relative to the benefits. Indeed, this is the very basis for granting market access to such devices. Viewing risk in absolute terms does not lead to a meaningful outcome because in that case pacemakers and ICDs would never be admitted to the market as a result of their ‘abnormal’ potential for damage. The ECJ seems to forget that this ‘abnormal’ risk is cancelled out by their equally abnormal benefit (you don’t die on the spot when otherwise you would). So as a consequence of the judgment of the ECJ we now have a known unknown category of devices with an abnormal potential for damage – but what type of devices fall in that category? 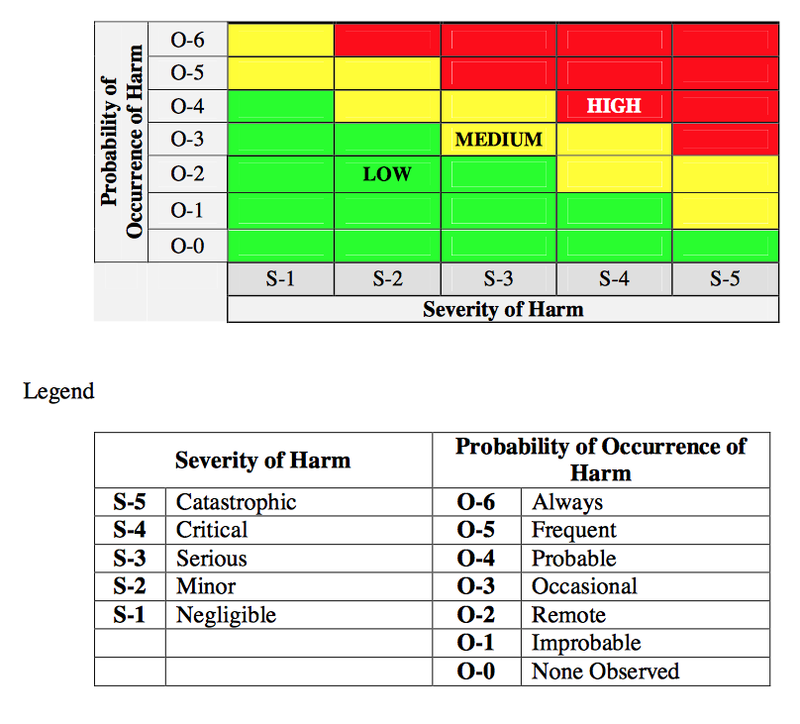 Indulge me in a though experiment with some basic thinking about risk management and try to point out in the below very well known GHTF risk chart for interpreting risk and communicating about risk where you would place an ‘abnormal potential for damage’. Top right corner only (most extreme risk)? Red only (high risk)? Maybe yellow in S-5 (remote probability but catastrophic harm)? Or should we think in the regulatory risk classes I, IIa, IIb or III under the Medical Devices Directive? Or only devices in scope of the Active Implantable Medical Devices Directive? This problem is impossible to solve this way, because the ECJ used an absolute and undefined term to indicate a particular risk. As a result, we have an additional point of argument between patients and manufacturers: is the risk profile of a device ‘abnormal’ enough to warrant product batch liability? In my opinion the ECJ has done nobody a favor with the term ‘abnormal potential for damage’ because it would seem to place certain (we don’t know which ones) high risk medical devices in a fictitious group of devices that should actually not be on the market or are ‘too dangerous’ or something and therefore a special type of product liability applies. This thinking is wrong and unhelpful, because it fails to take account of the fact that all medical devices admitted to the market have a risk profile that is the contrary of abnormal in their side effects and in their failure modes. Otherwise they could never ever pass the risk management requirements under the (active implantable) medical devices directive and should not be admitted to the market. I understand that the ECJ tried to make sure that patients would not be forced to pay themselves for removal of an active implant that the manufacturer himself says should be replaced as corrective measure. However, in order to arrive at that conclusion it did not need to go into a discussion of risk in absolute terms that flies into the face of the regulatory acquis in the field of risk management. Rather, it could have found that since a defect could only be established and managed by explanting the device in the first place, the associated costs would be the risk of the manufacturer since he ordered the recall. More practical and less confusing if you ask me, because now we are stuck with having to decide if the device concerned has a risk profile that allows it to inflict abnormal damage. The ECJ has done its best – it seems – to arrive at a solution that leads to the result that a patient should never be stuck with the medical costs associated with the replacement of a device that is subject to a manufacturer corrective action. However, its use of language about risk in absolute terms has made things a lot less clear than they were by limiting this to a category of products with ‘abnormal potential for damage’ distinguished from other products covered by the Product Liability Directive.